Urbana’s Isaiah Fonseca blows past his man on the baseline on Tuesday as Urbana beat visiting Shawnee. 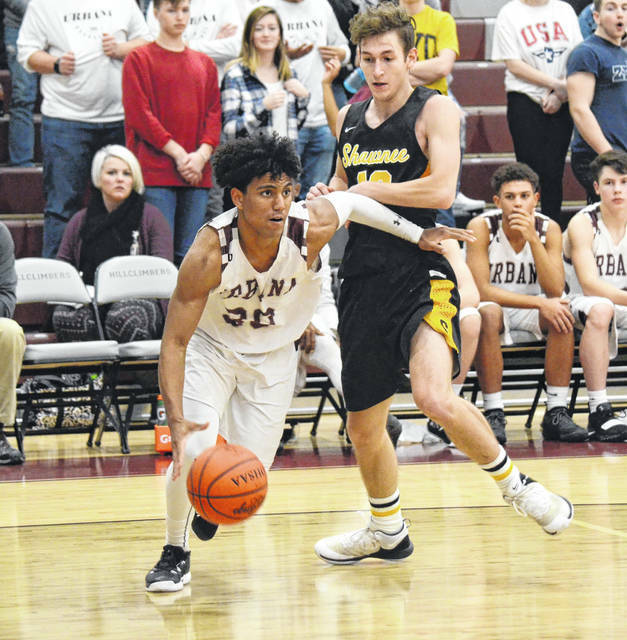 Urbana wore down an overmatched Shawnee squad and took the victory, 50-27, in CBC boys crossover basketball at UHS on Tuesday. The Braves (5-6) seemed game early, but faded as time wore on in the first half and then fell apart entirely as the Hillclimbers buckled down defensively. The Hillclimbers led, 30-16, at halftime. The cushion held throughout the second half, despite Urbana (7-4) turning the ball over several times in a row to begin the game after the break. “I don’t know how many turnovers we had, but it was a much better effort overall tonight,” Dixon said. Late in the game, Urbana’s offense finally came together, as ball movement and cuts were the name of the game. The home squad found space to drive or got fouled on multiple possessions, leading to the final margin. Dixon feels his team is trending in the right direction and he likes the spirit of the squad. Urbana plays at North Union on Friday. https://www.urbanacitizen.com/wp-content/uploads/sites/36/2019/01/web1_IsaiahFonseca011519_ne2019115203949877.jpgUrbana’s Isaiah Fonseca blows past his man on the baseline on Tuesday as Urbana beat visiting Shawnee.